VENUE: Conference Room, 17-25 New Inn Yard, London, EC2A 3EA (Amnesty International UK building). Once upon a time, two writers walked into a producer’s office and said three words: “Jaws in Space.” The script was Alien and that moment passed into Hollywood myth as the perfect pitch. Pitching is the great accelerator – a good pitch will accelerate all aspects of your career in film or TV. In this masterclass Charles Harris, award-winning writer-director and best-selling author of Jaws in Space: Powerful Pitching for Film in TV, will cut through the many myths and misunderstandings and make the process of pitching and selling a natural, enjoyable and vital part of your craft. Participants come from all over the world to his popular weekend pitching masterclasses. They have gone on to pitch successfully to agents and producers, including BBC Drama, Warner Brothers and Curtis Brown, to sell their scripts and have them made for cinema and TV. Be prepared to have your skills seriously expanded. How can you find your voice against the mainstream? What are commissioners actually looking for? 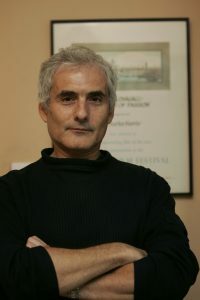 Charles Harris is an experienced award-winning writer-director for cinema and TV and a director of Euroscript. His first professional script was optioned to be developed by major agents CAA in Hollywood and he has since worked with top names in the industry from James Stewart to Alexei Sayle. He created the London Screenwriting Festival’s Pitching Thursday, has sat on BAFTA awards juries, lectured at universities, film schools and international film festivals and taught selling and pitching to writers, directors and producers across Europe. He is the author of the successful Jaws in Space: Powerful Pitching for Film and TV which, along with his Teach Yourself: Complete Screenwriting Course, is regularly in the Amazon bestseller lists and is recommended reading on MA courses. His debut crime-satire novel The Breaking of Liam Glass came out last month and immediately went to the top six in Amazon’s bestseller lists for satire.